This chile relleno casserole recipe is perfect for entertaining and a quick and easy meal to prepare for your family. You can serve this dish for breakfast, lunch, brunch or dinner. It works for all these meals. I have personally brought this particular recipe to pot luck dinners and people love it. One thing I have to mention, Do not use low fat cheese. You will be disappointed. I made the mistake of doing that one time and it really ruined the dish. I don’t know what I was thinking but I will never do that again. Click here to watch my Chile Relleno Casserole video. 1 1/2lbs. of shredded jack cheese or Mexican 3 cheese blend. Do not use low fat. Lightly spray the casserole dish with Pam. Drain and cut chiles into slices. 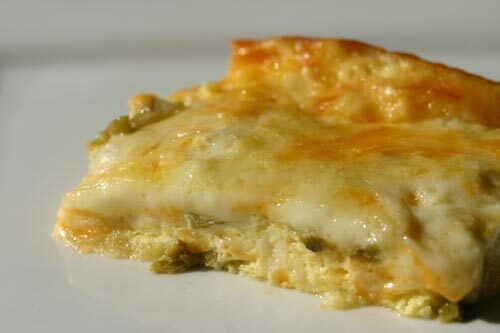 Layer chiles and cheese in casserole dish. Pour egg mixture over the chiles and cheese. Bake in a 325 degree oven for 45 – 50 minutes or until golden brown. If you are interested in making a complete meal with this delicious chile relleno casserole recipe, you can add spanish rice, beans , salsa and a margarita! Now we are talking party time! We have more for you to choose from.